Golden canaries in the coalmine? In the 1980s, portfolio insurance was all the rage. The idea was that one could always buy stocks, as derivatives could protect one’s portfolio on the downside. However, things turned from bad to worse in 1987 when the linkage between stocks and commodities broke down. These days, many algorithmic trading systems don’t take out “insurance” anymore, as stocks can be unloaded in nanoseconds. Or so the theory goes anyway; except that the recent rather violent correction in the gold market showed liquidity can evaporate in a heartbeat as many quant trading systems all at once appear to be taking a step back from trading the moment market action moves outside of preset parameters. Think it can only happen to gold? With stocks, we call these disruptions flash crashes; however, who says it can’t turn into a flash flood? Can a crash happen if “someone” dares to take a profit as the S&P reaches ever-new highs, prompting others to follow suit? Another scenario might be the conventional wisdom to “sell in May” stems from the fact that portfolio managers with sizable year-to-date gains might take a profit, staying on the sidelines for the summer. As the market corrects, retail buyers jump into the market, having been trained that every correction is a buying opportunity. Then, when retail has finally embraced the stock market again in the post 2008 recovery, the market crashes in earnest. There are eerie similarities to 1987. Anyone focused on fundamentals might shrug off the above as being hypothetical fear mongering. But fear not: with the Fed as your friend, investors need no enemies. Investors are chasing risky assets, be that stocks or junk bonds. And should the market crash indeed, well, the Fed might come to the rescue. So why bother even worrying about a market correction. Chuck Prince as head of Citi famously said he would continue to dance until the music stops. Except that the music had already stopped, and the bank needed a government bailout. Investors, retail and professional investors alike are not good at timing the markets. Former Federal Reserve Chairman Greenspan warned of irrational exuberance in 1996, yet the market peaked in 2000. Similarly, it was rather difficult to time the top of the credit bubble. I warned in late 2007 that rising volatility would bring the market to its knees as sophisticated levered players would liquidate assets to pair down their risk profile; few were listening at the time. Our biggest threat: economic growth? Take US Treasury bonds. We don’t need the Chinese to dump their Treasuries for there to be trouble in the bond market. We just need to return to historic levels of volatility in the bond market, and I expect hoards of yield chasers and momentum players to run for the hills. What could trigger a flight out of bonds? Rising inflation expectations could; however, of late, inflation expectations have been coming down. The bigger risk to the bond market might be economic growth. Let some of the money that has been printed actually stick and good luck to Fed Chair Bernanke containing the bond market. In many ways, preventing a selloff in the bond market should economic growth materialize appears to have been the primary goal of Fed policy. The Fed attempts to contain longer-term interest rates - specifically mortgage rates - by promising to keep rates low; by buying bonds; by engaging in Operation Twist; and if all these efforts are not effective enough, by shifting focus to an employment rather than inflation target. Forget about monetary, fiscal or regulatory policy for a moment; even forget about corporate earnings. We don’t even know whether or when the market will crash. Are all components in the portfolio fulfilling their role? Not everything in a portfolio should go up when the stock market goes up. That’s because only a truly diversified portfolio has a chance of offering downside protection should, for whatever reason, the market, god forbid, experience a downturn. Should any group of assets outperform the rest of a portfolio for an extended period, seriously consider rebalancing the portfolio. Rebalancing a portfolio is a great time to reflect on how to add uncorrelated returns to a portfolio. Pundits told you to stay the course in late 2008 after many investors had lost half their savings, sometimes more. Indeed, with markets now reaching new highs, those pundits will tell you: “I told you so.” But they are wrong. Someone who loses half their net worth can almost certainly not afford to take on the same amount of risk as before the loss, strongly suggesting that a lower risk profile is in order. The way to fix this, however, is to take profits before the crash. As such timing may not be possible, we believe prudent portfolio management requires taking chips off the table on the way up. Stocks. Stocks are risky assets. As stocks have gone up, odds are that risky assets comprise a bigger portion of one’s portfolio. Investors that want to crash-proof their portfolio should consider reducing their exposure to risky assets. Bonds. Bonds have had a great run for decades. US Treasuries are considered “safe.” But even with Treasuries, the “safety” is limited to being paid back the face value on maturity. Mutual funds holding bonds never mature, so while underlying issuers might not default, bond funds carry interest and credit risk. Investors have been rewarded for taking on both, with longer-term interest rates on a downward path for decades. Investors in search of yield have been buying riskier bonds, with junk bonds recently paying the lowest yields ever, as measured by the yield on junk bond indices. Even buying inflation protected Treasury securities, TIPS, investors take on interest risk, as investors tend to buy such securities with maturities many years out. If interest rates move higher because of either greater inflation concern priced into the market, or because of economic growth - bonds may be an increasingly risky proposition. And before anyone thinks that their favorite bond managers can outwit the markets, as evidenced by recent outperformance of actively managed bond funds versus their index peers, keep in mind that those managers have outperformed the markets by chasing yield; increasingly, bond managers are buying equities too. 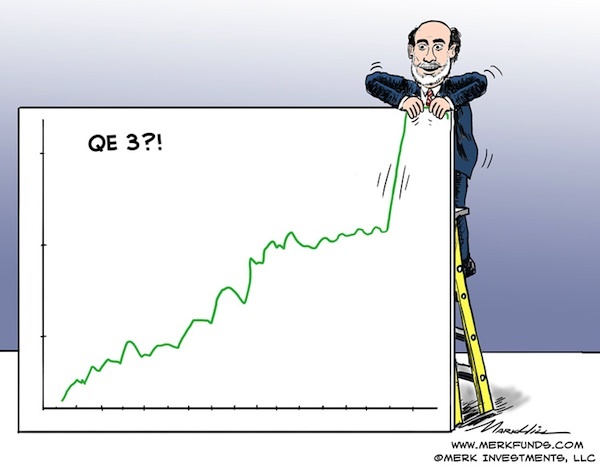 Such a strategy might work as long as Bernanke is healthy and is committed to printing; risk free it is not. Many investors have been exiting their bond holdings because of these risks, buying stocks instead. But is it really just an alternative between stocks and bonds? Cash. Warren Buffett missed the tech boom in the 90s, yet he came out just fine as the market tumbled in 2000. Cash has its role to play in a portfolio. Except wait: the U.S. dollar might not be that ultimate safe haven after all. Not only may it be a myth that we are in a rising dollar environment (see our analysis Rising Dollar Myth), more importantly, investors’ purchasing power may be at risk in an era of financial repression. When the Fed imposes negative real interest rates on savings, holding U.S. dollar cash is a risky proposition. And that doesn’t even touch on the risks to the dollar posed by what we believe are unsustainable long-term deficits due to the lack of progress on entitlement reform, as well as the risks posed by higher interest rates on the U.S. government’s budget. We are not making much progress here on safe havens, are we? If we are concerned about the U.S. dollar, we should have a look abroad. International stocks. When policy makers are actively engaged in the markets, markets chase the next perceived move of policy makers rather than reflect fundamentals. As such, investors have been rewarded with additional volatility by investing in international stocks, but not really with diversification, as international stock indices often move in tandem with US indices. The downside of this is that when the tide turns, investors might get little of the benefit of holding international stocks. International bonds. International bonds provide investors with an opportunity to diversify out of the dollar without taking on equity risk. However, such bonds carry interest and credit risk, such as their U.S. peers. Some yield much more, such as Greek bonds that were recently upgraded by Fitch. We are not suggesting investors should buy Greek bonds, merely pointing out the irony of a downgrade is that one can subsequently be upgraded again. Currencies. Investors looking to eliminate equity risk while minimizing credit and interest risk, but also not interested in too much U.S. dollar risk, may want to consider looking at holding cash in different currencies. Currencies historically have a low correlation to equities or bonds. This clearly introduces currency risk to a portfolio, but maybe that’s the sort of risk that’s under-represented in a portfolio. Investing in the S&P 500 provides much less international diversification than you might think, as about 90% of the earnings of S&P 500 companies are hedged back into the U.S. dollar (please see our white paper U.S. Investors Overexposed to U.S. Dollar Risk?). And investing in an international equity fund rarely focuses on managing the currency risk specifically; indeed, as we indicated above, investors have been getting more beta (volatility), but little extra alpha (added performance). Unlike their reputation, currencies are less volatile than stocks or bonds. When the euro moves a full cent versus the dollar, it moves major economies, but on a percentage basis, it’s a small move. Because of their inherently lower volatility, currency strategies - as long as they don’t use leverage - may offer downside resilience in an investment portfolio (“resilience” does not suggest one cannot lose money, but a less volatile strategy might lose less money than riskier alternatives in a down market). We believe currencies reflect the ‘mania of policy makers’. Investors buying stocks because of quantitative easing should be aware that they are taking on a great deal of noise of the equity market. The currency market, in contrast, might provide for a more pinpointed way of projecting policy moves onto the currency market. We may not like what our policy makers are up to, but think they are rather predictable. Not all central banks are created equal. As central banks print varying amounts, it proves that currencies are not a zero sum game. We believe studying central banks provides an opportunity to stay a step ahead of policy makers, so that investors have an opportunity to profit from rather than necessarily suffer from the so-called race to the bottom. We urge everyone to sign up for Merk Insights, our newsletter where we dedicate a lot of time to discuss how global dynamics impact the U.S. dollar and currencies. Gold. So is gold the safe haven we have been waiting for? In 2008, gold performed rather well. In recent months, however, pundits have come out suggesting the shine has come off the yellow metal. I personally like gold because there’s too much debt in the world; while the Europeans are experimenting with austerity, the Brits, Japanese and Americans are, in my assessment, more likely to deploy their printing presses in an effort to kick their respective cans down the road. But risk free, when measured in U.S. dollars, it is not. Indeed, the volatility of the metal has been significant of late. But gold is an example how something not moving in tandem with the rest of the portfolio may be something to be embraced rather than shied away from. For a more in-depth discussion on how gold might have valuable diversification benefits, please see the Merk Gold Report on the topic. Other Commodities. There are other commodities, but keep in mind that as volatile as gold is, it’s historically the least volatile commodity. When moving beyond gold, dynamics also get more complex, going beyond the scope of the analysis here. Other Alternatives. There are other alternatives beyond currencies, gold & commodities in general, some of which seek absolute returns. In principle, pursuing an absolute return strategy may be a good idea to protect a portfolio to the downside. But keep in mind that in 2008, when push came to shove, many alternative strategies could not be executed as stocks could not be shorted in long-short equity strategies; and liquidity completely dried up in more esoteric strategies. Another reason to have a look at currencies, liquidity is generally not a problem: about $4 trillion in currency transactions take place every business day. To learn more, please join us for a webinar: click to join our webinar list; our next Webinar is this Thursday, May 23. Also don’t miss another Merk Insight by signing up for our newsletter.